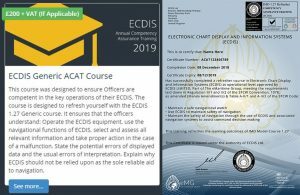 The non-profit certificated 1.27 Generic package is Â£200 per vessel regardless of crew numbers, and in 2019 incorporates the PSC and Inspection preparation package including training and testing on all Inspectors questions.Â It is used by thousands of seafarers and has dramatically increased standards by consolidating all training. The eMaritimeGroup is the public name of the UK registered MCA training provider ECDIS Ltd.Â As a training company with a portfolio of courses ranging fromÂ DeckÂ toÂ Security, they have a trusted and growing client base of 147 large commercial shipping companies, governments and military clients that span every continent.Â As a published author, they have written various publications from inserts for the International Chamber of Shipping to international bestsellers such as the ECDIS Procedures Guide and ECDIS Manuals found on most vessels and nautical institutions around the world. PRESS RELEASE: The eMaritime Group proves to be the cheapest ENC Provider with Price Match Guarantee. You must be registered & logged in to visit this app. Register for FREE!